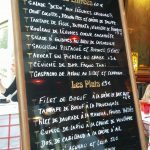 Want to go through the Parisian bistros during your visit of the capital? 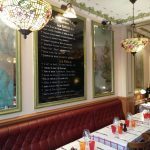 Do not hesitate to go and eat at le Mathusalem Paris, this restaurant offers a varied menu and a very French atmosphere, perfect to live your Parisian experience. You will be able to find, in this brasserie where you can feel the style of the 1930s, traditional French cuisine represented by delicious menus such as « magret de canard » (duck) or beef tartare (16 €). You can also taste the starters, equally delicious such as the camembert crumble or citrus quinoa (10 €). As for the desserts, you will find the famous macarons (with lime) and the French « moelleux au chocolat » (10 €). Thomas, the manager of the restaurant, is waiting for you with his team to serve you many more food choices, prepared by chef Cyril. The decor is set with tablecloths and a bar. The restaurant is located in the 16th district of Paris (south-west), just in front of the Garigliano bridge (Pont du Garigliano), near the Auteuil neighborhoods (Parc des Princes, Roland Garros …), and the Maison de la Radio. Nearby you will also find the Bois de Boulogne. Do not miss the Le Mathusalem Paris experience and click here to find out more. Open from monday to saturday, from 11:30am to 1:30am. Access : 5 bis boulevard Exelmans, 75016 Paris. RER C Pont du Garigliano – Hôpital Européen Georges Pompidou (you will just have to cross the bridge), Metro 10 : Chardon Lagache, Metro 9 : Porte de Saint-Cloud.